Tanya and me with the wreck. I was told a few days ago by a BBC contact that a senior executive had offered to resign after the Newsnight episode, but Entwistle, the Director General decided he should go instead. If this is true the promptness with which management are prepared to fall on their swords is refreshing. I’ve had experience with lower level executives in various broadcasting organisations including the BBC. Some are good, and some are awful, only making their presence felt when they elbow their way to the stage to collect the BAFTA. A fellow producer of mine once described an executive she was working for as possessing all the attributes of a dog except loyalty. A harsh judgement but a very fair one it transpired. Reading the internal BBC report into the Newsnight programme I was taken back to an afternoon in early spring in the Lake District many years ago. I was on a barge in the middle of lake Coniston. Alongside, suspended from several large orange flotation bags was the wreck of Donald Campbells jet propelled boat Bluebird. I was talking to a cameraman when my mobile phone rang. It had been ringing peristently all day. A lot was going on. Tomorrow morning was going to be the finale of the of the effort to raise Bluebird. We were going to bring the wreck ashore in front of a large crowd of spectators, press photographers and live television cameras. The barge was crowded with divers and crane operators, cables and hoses snaked across the deck connecting generators, compressors and straps, and the cameraman and sound recordist were trying to cover everything for a documentary. Divers were going in and out of the water checking the condition of the wreck and whether it had shifted on the straps that were supporting it about twelve feet under the water. As we approached the shore it would have to be gently raised to avoid grounding on the bottom of the lake. It was a delicate business. It was also potentially dangerous. An amateur diver had already had a serious accident early on in the search for the wreck and nobody wanted another one. I was talking to the cameraman to make sure that he was able to capture the interaction between the various groups, the workers, the professional divers, and the sports divers who had driven the project along, all of whom were becoming slightly stressed as the big moment loomed. Throughout the day I had been telephoned by people from BBC White City, the journalists and BBC press officers on the shore and the assistant producer who was driving up from London with Tanya Campbell, Donalds widow, who had arrived the day before from Los Angeles. Tanya was not feeling well, and there was also another passenger in the car, who it turned out was a reporter from the Mail on Sunday, although we did not know this at the time. A lot of very critical eyes would be on us the next morning. I had already had a difficult meeting with the local Chief Constable, who was alarmed about the volume of traffic that would clog up the roads leading to Coniston, and the National Park management had said that they were still considering whether we would be allowed to bring the wreck ashore on their beach. The person who was phoning at this time however was none of these, it was Lord Mishcon, the Labour Peer and Senior partner in the law firm Mishcon de Reya. 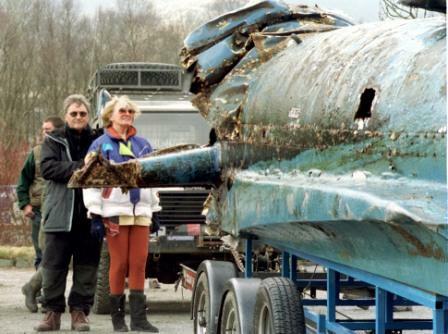 He wanted to know under what authority we were moving the wreck, and said that a member of the family was considering seeking an injunction against the BBC. This came as a shock. I thought that the various family members had all been consulted, but this was not something I wanted to deal with from the back of a barge. Lord Mishcon was not just any old lawyer, he was a member of the legal establishment and had acted for princess Diana in her divorce proceedings. It was better that somebody more senior than I talk to him. I gave him the mobile phone number of an executive at White City. No sooner had Lord Mishcon rang off than I immediately phoned the executive and told him what to expect. I could have saved my breath. The executive had no intention of getting involved. He immediately switched his phone off. For the next two hours I had increasingly irritated telephone conversations with Lord Mishcon, which ended only when the battery of my phone died. The inquiry on the Newsnight programme says “there was ambiguity around who was taking the ultimate editorial responsibility for the Newsnight report,” and that more or less sums up what I thought that evening when I walked to my bed and breakfast in Coniston, although the language I used then was much coarser.